Vanessa G.* was on her way to pick up a family member from work when she began to feel sick. It was the first time she had a panic attack. Scared and not knowing what to do, she pulled over the car. She called her mom, hoping she would calm her down. While she was able to finish the drive, the frightening feelings and shortness of breath stayed with her. Vanessa knew she needed help. A few weeks before the panic attack, Vanessa unexpectedly lost a friend. Not long after, her aunt also passed away. The blow of two losses, back to back, combined with stressors of school, pushed her into the rocky waters of anxiety. The panic attack in the car was a sign for Vanessa that she needed help getting out of this state of mind. She looked for help with Counseling and Psychological Services (CAPS) and met her therapist, Kate Kominars. The pair met weekly for about three weeks. When Vanessa started to show signs of progress, Kominars suggested that they move from in-person sessions to an online tool known as TAO Connect. Therapist Assisted Online, or TAO Connect, is a treatment that uses cognitive behavioral therapy modules that include videos and informational presentations. 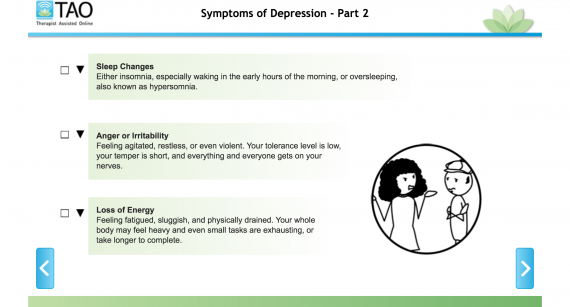 The modules teach clients about what causes depression and anxiety; how to identify common symptoms and personal triggers; and what strategies and techniques people can use to overcome their problems. For example, to treat anxiety, students learn deep breathing, mindfulness meditation and visualization. The online program assists clients going through treatment for mild to moderate anxiety. Therapist Assisted Online, or TAO Connect, is a treatment that uses cognitive behavioral therapy modules that teaches clients about what causes depression and anxiety, how to identify common symptoms and personal triggers, and what strategies and techniques people can use to overcome their problems. “We’re able to do online video conferencing sessions to augment and support the treatment modules that people do on their own,” Kominars says. She also likes that it allows students to access the modules from anywhere or between semesters when they’re not coming to campus as often. The 20-30-minute video conference sessions gives therapists the ability to schedule two clients in one hour, thus seeing more people throughout the day. In Vanessa’s case, TAO was continued for about two months after their initial meeting. Vanessa credits the online modules with helping her better understand what she was feeling and gave her multiple methods to calm her anxiety. She really liked that she could log in at any time, a stark contrast to weekly scheduled therapy sessions. Research results show that TAO Connect works as well as traditional therapy, but Kominars describes the program as a great fit for highly motivated students who want to get better quicker. In addition to teaching students skills to address their anxiety, the modules also reinforce healthy lifestyle habits, like going to the gym, getting enough sleep and eating regularly. Since CAPS began using TAO in Spring 2015, more than 100 students have used the program either as stand alone treatment or in conjunction with individual therapy. Kominars said it’s not for everyone, but those that use it do report feeling better. Today, Vanessa is much more in control of her anxiety and feels better equipped to handle her emotions on her own. She hopes that others who are struggling will seek help. All students who have paid the student health fee have access to free, confidential services at Counseling and Psychological Services. A 24-hour hotline is also available at 305-348-3000. *Name has been changed to protect the identity of this student. Does the center routinely attempt to treat anxiety disorders without referral to Psychiatrists, or is this a unique case? The TAO treatment is typically offered to individuals who are experiencing mild to moderate anxiety and meet the criteria for cognitive behavioral intervention. If a referral to a psychiatrist is indicated based upon symptom severity and level of impairment of functioning, and the client is open to pharmacological intervention, we make such referrals in conjunction with therapy. Thanks for the reply Kathryn. I guess I’m a little confused to the care model. I was under the assumption that medical personnel were in a better position to evaluate signs and symptoms and to determine if they are of a neuroligical or psychiatric nature. Furthermore, wouldn’t it be more appropriate for a Psychiatrist who is capable of doing so to be the first point of contact? This way the Medical Doctor could treat the neurological root of the problem or refer out the therapy to non-medical personnel for therapy modalities?This could prevent the mis-diagnosis of a potentially life threatening condition as something more mundane such as an anxiety disorder.